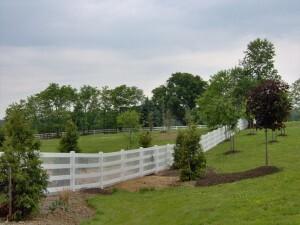 What Can your Fence do for You in the Woods? Do you live in the woods? You may feel as though you don’t need a fence because, after all, who is it going to keep out? You might not have neighbors for miles around you. So, why bother to invest in a fence? Well, there are actually several reasons that your secluded property could still get some great use out of a fence. Let’s check them out! Keep out the unwanted wildlife. Foxes, coyotes, and other predator types might enjoy a romp through your trashcans, outdoor dog food, or anywhere else they might smell a late night snack. Keeping your yard clear of little scavengers hinges on your ability to seal your perimeter. So, investing in a fence might help keep some of the little guys out. Bears are a completely different story and might require an electric option for your security. Your ownership becomes clear to others. If you own a large expanse of property then you probably won’t be able to stop people from just walking through it on your own. Map out where your property ends so that strangers will know when they are trespassing. Some people may be walking through your property without even knowing it. So, it is a courtesy of sorts to let them know when they’re moving into private land. So, fence off your property if you want to keep the critters and the people out. It’s the smart thing to do, even if you live in seclusion. This entry was posted on Monday, April 6th, 2015 at 3:31 pm. Both comments and pings are currently closed.